Invercargill’s City Centre will become a Kiwiana Christmas spectacle on Saturday (8 December 2018) when Esk Street is closed to traffic and hosts the City Centre Christmas Festival and Market from 10am to 2pm. Gemma Crawford, a Community Development Officer for the Invercargill City Council, is running the event this year and she’s enthusiastic about the family-friendly entertainment on offer. 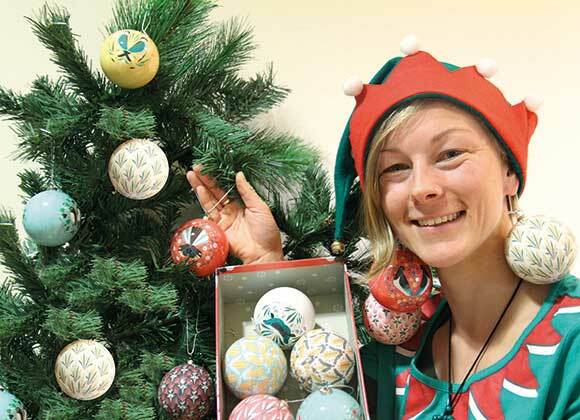 Kiwiana baubles are a hit with Festival organiser Gemma (click the image for a larger version). “Throughout the day there’ll be roving faeries, live music, face painting, bouncy castles and a family photo booth,” Gemma says. “Market stalls will offer gifts ranging from handmade craft items, jewellery and clothing to natural beauty products and homeware. “The local retailers will be open too, so there will be something for everyone – a perfect chance to get those Christmas presents sorted in one place without the mad rush,” Gemma says. But wait, there’s more! This year there will be a parents room with breastfeeding and baby change facilities – and be sure to check out the SIT Arcade which will be turned into a New Zealand native bush Christmas Grotto. Join in the Christmas Festive Spirit and come along dressed up in a Kiwiana theme – there will be spot prizes for the best efforts. We look forward to seeing you there! This entry was posted in Entertainment, inner-city, Invercargill. Bookmark the permalink.